A quick snack, dinner or lunch to share dish. I only discovered it a few weeks ago and you can cook your own veal or use any other good quality pre-cooked meat. Whiz it all together on a blender or food processor, check seasoning. 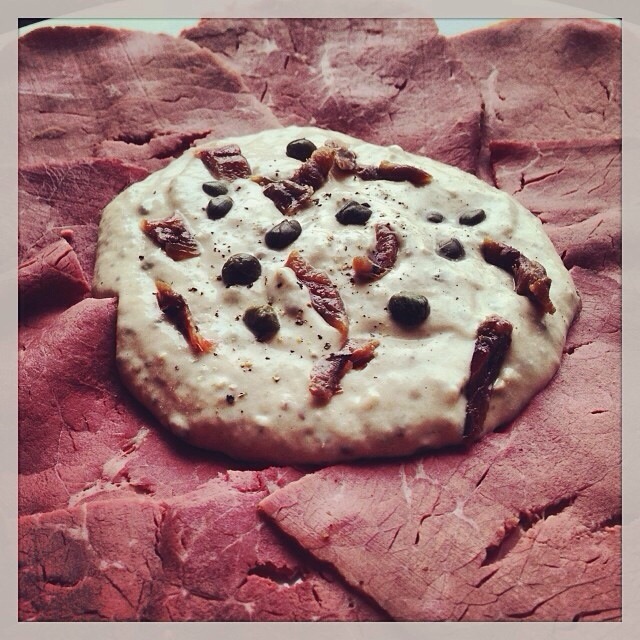 Serve on top of thinly iced veal or beef, decorated with some extra capers and anchovies. This entry was posted in catering, cooking, eating out, food, home, home cooking, italian, kitchen, love, nutrition, restaurants, small kitchen appliances, snacks, Uncategorized and tagged capers, food, italia, quick, veal. Bookmark the permalink.